I’m so happy to be working on my show “Hillary Clinton’s Song Cycle: Witness” which is based on the concept album I released last year. I’m rehearsing the show for productions in both the New York and Baltimore Fringe Festivals this fall. The show grew so much over the spring and summer. We’ve added the lovely Irene Carroll as director. She is challenging Deidre and me in all the best ways and bringing everything together, with tech, lighting, and even a little choreography! We are working hard and the show is funnier and more heartfelt. So happy it gets to be in a real theatre context where it so clearly belongs. Can't wait to share it with you. Info on tickets and performances below. Big news for The Hillary Project & more gigs! "Witness" has been selected to be part of the New York International Fringe Festival in October!! I am honored and excited to have the opportunity to bring the show into a multi-disciplinary/ theatrical context, where I think it really belongs. More details soon. Monday, June 25 at Starr Bar in Bushwick. All proceeds go to Planned Parenthood! More info. Maude Gun is a punk/art-folk feminist duo and they blew me away when I saw them live last year. Their song cycle Claudia, The Word is based on the story of Claudia Quinta, a Roman matron who delivered the goddess Cybele to Rome in 204 BC. You gotta see it. They are really something. I will be playing a new song in Julie Gold's "A Little Knight Music" show at The Duplex on June 16. Julie wrote her 1991 Grammy-winning song "From A Distance" on her childhood Knight piano. She believes it is possessed with magical powers, so she invites songwriters to her home to spend an hour alone with the piano. Eventually, she showcases the next crop of songs written on the Knight. I will be playing what I wrote, along with the last few musicians to visit the piano. Get Tickets. New videos and my cabaret debut! After the show I got some excellent feedback. Everyone I spoke with felt I should go further with "Witness" and have it staged, with a director, in a theatre space, etc. I am really clueless as far as that world, since my last musical theatre performance was my high school production of Godspell in 1997! Regardless, I am diving in. I've started to send "Witness" around to reading series and such. If you haven't heard "Witness" yet, you can stream the whole album on Spotify and at witnesshillaryproject.com. You can also buy it on CD (along with all my other records) -- it's a great holiday gift for the feminist and/or Democrat in your life. Thanks for stickin' with me and to all the Kickstarter backers who made "Witness" possible, I am so grateful. I can't wait to see where it goes next. P.S. For my fans in the UK and Ireland: Rich and I will be returning this coming summer 2018 for a tour. I'm now represented by Brookfield Knights and am looking forward to seeing what that brings as far as gigs and such! New record! A concept album about Hillary Clinton. Imagining the inner world of Hillary Clinton in the weeks following the election. I am fundraising on Kickstarter to make this happen. Everyone who donates gets the record early, before the official release, plus other limited edition gifts like a poster signed by the entire female creative team, sheet music, tickets to the release show, etc. After the election, Hillary Clinton all but disappeared. I worried about her and wondered what she was feeling, thinking, how she was coping. I began writing songs from her point of view, an inner monologue of her life during that mysterious time. In "Witness" we follow Hillary as she goes for walks in the woods, wrestles with the voices of her doubters, dances in her living room barefoot, and swears... a lot. Her monologue travels from disbelief to depression, rage to grief, and acceptance to hope. One of the best things about the new album is that the creative team will be all female. I've assembled a dream team of female talent and I could not be more excited about that. We will be recording the album over the summer, for release on November 8, 2017 (the one year anniversary of the election). Today I release a new single and an accompanying video. The song was written the day after the presidential election. It's a sad one, but I hope it's cathartic for some of you. I wrote “Where Are You Now?" on November 9, 2016. I'd spent the night prior at a gathering of women, energized and ready for a historic moment. That moment never came. Instead the wind was knocked out of us by what felt like the sudden death of a close friend. Smiles turned to tears, disbelief, humiliation. Months later, a profound sense of loss continues to follow me around, though I am amazed by the energy and conviction that have emerged as well. The single’s cover art (above) is a photograph of a piece by artist and friend Spencer Merolla. The piece is called "A Loss". 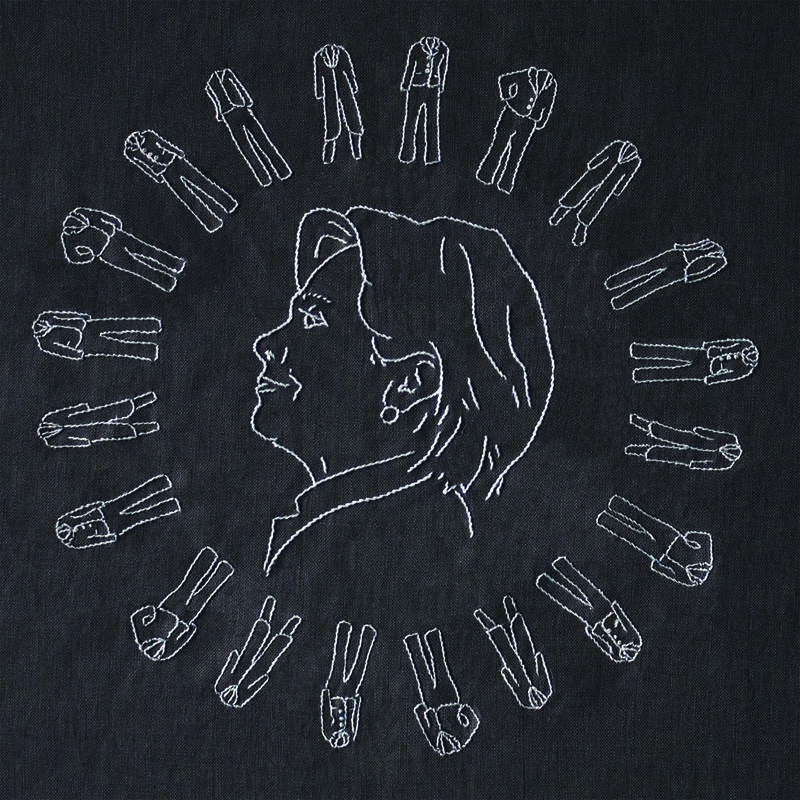 Spencer crafted it from the clothes she wore on election night: a white pantsuit honoring the Suffragettes. It seems perfectly fitted to go alongside the song, as she was working through her grief too. The video was filmed and directed by Mark L. Feinsod at Acme Hall Studios and features my debut playing piano in front of a camera. It's good to be vulnerable sometimes. "Where Are You Now?" is on iTunes, Bandcamp, Spotify and other digital music outlets. This Saturday night, I am so honored to be a part of this great tribute to one of my favorite albums. I'm singing lead on "Only The Good Die Young" and doing backing vocals on several tunes PLUS, and perhaps most exciting: I'm doing the whistling part on the title track. Woot. Thrilled to report we will be returning the UK in April for our first tour there in 3 years! Tickets and more info on the shows page. I'm so proud to be hosting and playing a song at this amazing concert with some of the best musicians and songwriters in NYC. Everyone will be performing a song they wrote since the election. It's sure to be an emotional and exciting evening. All the proceeds go to CHiPS, a local soup kitchen and women's shelter. It's the first in a series of regular concerts our studio Acme will be presenting at the Greenwood Church in Park Slope. I'm excited to report that I am this week’s guest on Coffeehouse Conversations on WYEP in advance of our show in Pittsburgh. I will be guest DJing and talk about the new record. Two amazing 4 star reviews for the new record! New Record "Known Objects" out today! Hello! I’m thrilled to report that my new album “Known Objects” was released today. I’m so proud of this one and of the amazing musicians that contributed to the recording. You can get a physical copy of the CD at my store. It is also available for purchase digitally on iTunes and Bandcamp, and is streaming on the listen page and on Spotify and lots of other services. Anyone who has pre-ordered digitally should have gotten the files this morning. WFUV, WFMU, WDVX, WFDU, WTMD, WSCA, WMBR, WERU, WRIU, WMSC, WYEP, WMFO, WEFT, WFMT, WNUR, WDCB, WYCE, WRRW, WVIA, Kansas Public Radio, KFAI, KLCC, KBCS, KRVM, KRSH, KDNK, KZYX. In the UK & Europe: BBC Radio Scotland, BBC Radio Wales, BBC Radio Ulster, BBC Radio Hereford & Worcester, ALL FM 96.9, Amazing Radio, Celtic Music Radio, BC-FM, Croydon Radio, Radio Winchcombe 107.1, Hermitage FM, Severn FM, Chemlsford Community Radio, Swindon 105.5, Radio Summerhall, Radio Veralum, HFM 102.3, Phonic 106.8, KA Radio, Meridian FM, KX Radio, Meer Radio, RTV Baarn, RTV Purmerend, RTV Noordoost-Friesland, Roots & Fusion, Roots Paradise, Omroep Vlaardingen, Radio Capelle, Radio Mol, Radio Parkstad, Plastico Elastico, Ems Vechte Welle, Highway 61. Thanks to everyone who joined us in NYC for the CD release show at Jalopy Theatre. You all got to hear and buy the record before the official release date. How ARE you? I want to tell you what an insane snowstorm we had here, but the truth is, I went to Mexico for a week and completely missed it. Best timing ever! I haven’t played in some of these places, well, ever. So that’s exciting. The new record “Known Objects” is nearly done. Release date is May 6 with copies available at shows and via pre-order in April. We’ll get back on the road again in spring to do CD release shows. If you have a venue you’d like to see us at or a house concert you recommend, please get in touch. Holiday single “Snowing Sideways” out today! New holiday single “Snowing Sideways” and music video out today! Buy the song on Bandcamp, iTunes, eMusic, and many other digital music outlets. I’m so excited to share with you my first release of new music in nearly three years. “Snowing Sideways” is the first single from our new record which will be released in full in late spring. “Snowing Sideways” was recorded at our new space Acme Hall Studios and produced by Rich Bennett. Rich plays a variety of instruments on the song including acoustic guitar, tenor guitar, octophone and octave guitar, as well as piano. We were joined by Dan Shuman on upright bass and Spencer Cohen on percussion. I opened for Madeleine Peyroux earlier this month. It was a real treat to share the stage with her. Her cover of Elliot Smith’s “Between the Bars” has haunted me for over a decade. Sang with Lucy Wainwright Roche at a holiday comedy show hosted by NPR’s This American Life and Ira Glass. The show featured some incredible comedians including members of the cast of SNL. An honor. Booked my NYC CD release show for Friday, April 15 at the Jalopy Theatre! We are continuing to work on our new album and have had so many wonderful special guests in to record with us. Here’s who came in during November: Karen Dahlstrom from Bobtown, brilliant guitarst Ben Monder, cellist and songwriter Serena Jost. Thank you so much for checking out “Snowing Sideways.” I’ll be in touch after the new year about pre-orders for the new record. I’ve booked a couple of record release tour dates so far but am looking for more northeast shows the last week of April and other areas over the summer. Do get in touch if you’d like to host a house concert or put us on at your venue. Have an excellent rest of 2015 and happy holidays! Recording our new album and other adventures. The first half of 2015 flew by as Rich and I got our recording studio and music education space Acme Hall Studios up and running. During off hours, we’ve been recording our new album. The arrangements for this next release build on the sound we’ve created touring as a live duo over the past few years. With the guitars as the driving force, our approach is more intimate and acoustic. We are so excited to be welcoming in special guest musicians Spencer Cohen, Serena Jost, Greta Gertler Gold, Emily Hurst, Dan Shuman, Deidre Struck, Karen Dahlstrom, Lucy Wainwright Roche, and many more, to add layers of harmony voices, upright bass, cello, and percussion to the record. The album will be released in spring 2016 with tour dates to follow. I’ll have pre-orders available in the winter. We are releasing one of the songs, “Snowing Sideways”, as a holiday single in early December. You can tell by the name that the timing will be perfect. In other news: I had a fantastic time opening for Shawn Colvin around the northeast in April. Just as spring was springing, we got to get back on the road and see trees blooming. We played to wonderful audiences of dedicated music listeners and worked out many new songs including our cover of “Heatwave” by The Blue Nile, which will be on the new record. On July 4, I had the honor of singing with a small choir at the one and only Nathan’s Hot Dog Eating Contest in Coney Island. I don’t think I have ever experience an event that embodied Brooklyn as much as this one. It was awesome to be a part of it. In case you’re wondering, Joey Chestnut ended his 8 year winning streak by being beaten by a newcomer who ate 62 hot dogs in 10 minutes. Thanks and enjoy these (hot) dog days of summer! April 2015 dates supporting Shawn Colvin!